A big payday for Red Hat stockholders courtesy of Big Blue. On Oct. 28, IBM (NYSE:IBM) announced that it'd be scooping up Red Hat (NYSE:RHT), which was described in the press release announcing the deal as "the world's leading provider of open source cloud software." Let's go over the terms of the deal and what it'll mean for shareholders of both Red Hat and IBM. Red Hat shares peaked at $177.70 per share back in June, before pulling back sharply after the company issued -- as my colleague Leo Sun described it -- "tepid guidance." Shares closed at $116.68 on Oct. 26, a 34% drop. The good news is that if you held through the drop, IBM is making you whole -- and then some. The companies said that IBM will be paying $190.00 per share for Red Hat, a nearly 63% premium to Friday's close and a roughly 7% premium to the 52-week high that it set in June. This is an all-cash deal that the press release says IBM will fund "through a combination of cash and debt." "Joining forces with IBM will provide us with a greater level of scale, resources and capabilities to accelerate the impact of open source as the basis for digital transformation and bring Red Hat to an even wider audience -- all while preserving our unique culture and unwavering commitment to open source innovation," said Red Hat president and CEO Jim Whitehurst. IBM's business has been relatively growth-challenged for a while now. After delivering a few quarters of modest year-over-year revenue growth, the company reported a 2% year-over-year sales decline last quarter (although the company did say that the result was "flat adjusting for currency"). Analysts expect the company's sales to decline by 3.2% in the fourth quarter. 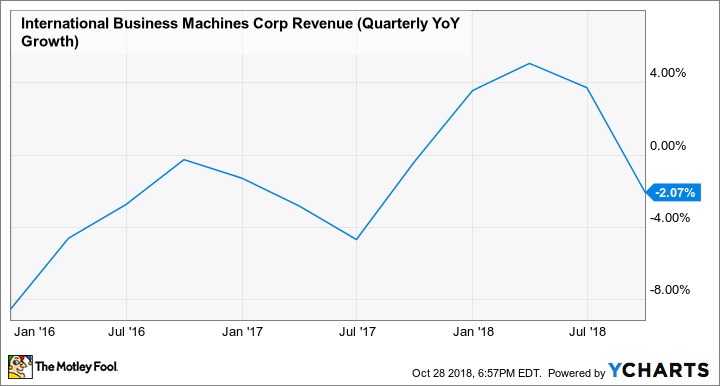 For the full year, they're modeling IBM's revenue to grow by 0.7%, although sales are expected to decline by 0.7% in the following year. Although IBM's business as a whole hasn't delivered good growth, there are parts of the business that are growing but are being offset by declines in other areas. One of those growth areas has been the company's cloud business, which IBM said in its third quarter earnings release turned in $19.0 billion in revenue "over [the] last 12 months" and grew by 20% over the same period a year ago (and, according to the company, was "up 18% adjusting for currency"). It's not too surprising, then, that IBM would scoop up a fast-growing cloud software maker to further bolster those efforts. In the press release announcing the deal, the companies said that the acquisition of Red Hat "will accelerate IBM's revenue growth, gross margin and free cash flow within 12 months of closing." 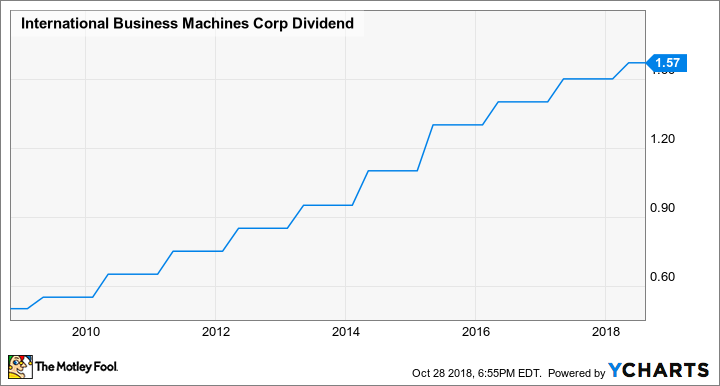 Since IBM is a high-yielding tech stock, currently offering a dividend yield of over 5%, the press release included the following line, perhaps to assure IBM shareholders that this fairly large acquisition (the announced purchase price "[represents] a total enterprise value of approximately $34 billion") wouldn't derail Big Blue's dividend strategy: "It also will support a solid and growing dividend." The deal, the companies say, is "expected to close in the latter half of 2019."